Scroll through your Facebook feed and you’ll notice that it’s full of videos. In fact, one third of all online activity is spent watching videos - so it’s not just on Facebook, it’s everywhere! The strong push to video is a direct response to audiences’ wants. With so many people viewing videos, businesses - like yours - must keep up with the trend. Videos are the now and the future. Plus, it’s a great marketing tool! Viewers are 80% more likely to recall information they saw in a video and 92% of mobile video consumers share that content with their friends. It’s honestly a gold mine. 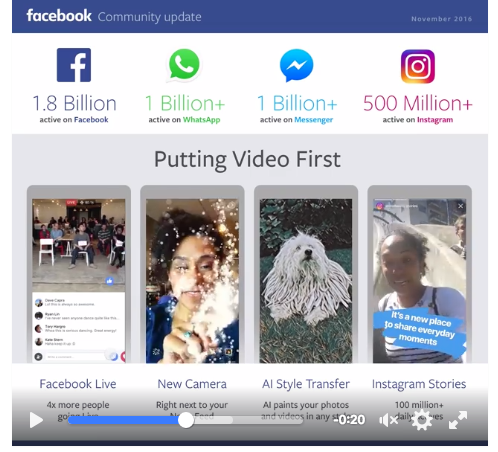 During a year-end announcement, Facebook founder Mark Zuckerberg announced that the social media network is focusing on “putting video first” across its applications. “People are creating and sharing more video than ever, so we’re building new tools to make it easier to express yourself in creative ways,” Zuckerberg wrote. “The number of people going Live on Facebook at any moment has grown by 4x since May. We launched Instagram Stories less than 3 months ago, and already more than 100 million people are using it every day. We're also building a brand new camera across our apps and we'll be adding even more visual messaging tools over the next few months,” he continued. Whether it’s Facebook Live or videos that your property creates through a professional service, it’s important to add video into your content plan. Your video content will get in front of customers' faces. When you log onto the Facebook mobile app, for example, you’ll notice a new video button on the bottom panel. When you click on this button, you’ll see trending videos and content from pages that you follow. Best part - If someone follows your page, your content will show up at the top giving them quick access to your videos. This space has great potential for your property. More than half of Facebook users access the network ONLY on their mobile device. This easy access to video content increases views for your business and drives a new audience of potential residents. Honestly - the possibilities for video content are endless, especially when you own and operate an awesome, beautiful property. To get you started, or help with some inspiration, here are five video content ideas to take advantage of Facebook’s new initiative. Facebook Live is an amazing tool for businesses. Not only does it present a unique way to share content, it also allows you to interact with viewers in real-time. Use this tool to host weekly Q&A sessions with your residents or potential residents. You can see viewers questions in real time and then the video stays on your page for anyone to watch! When you have a new unit available, hold a live walkthrough. Similar to the Q&A session, you can answer viewers questions about the listing in real time. Promote the video before it airs so your users are ready to watch and can be engaged during the walkthrough. Sometimes it’s best to leave it to the pros. If you need a great way to showcase your property, work with a videographer to create a professional promo clip that you can feature on your page. Chances are, your residents are sharing amazing content right inside your property. Share their videos from Instagram or Facebook on your property’s page. It’s a great way to feature authentic, real content that showcases your property’s personality. Everyone loves “behind-the-scenes” views of a business. Start featuring your team! Your viewers want to know who’s running day-to-day operations inside their building. One of the most important things you can do for your property’s social marketing - right now - is to start creating video content. Make a plan to share videos on Facebook at least once a week.